Upon receiving a new word (basically being invoked through the command line, or via the Flask app), check if we already have that result set cached and if it is within-date (I didn’t want to keep downloading new definitions if I last got one < 30 days ago). 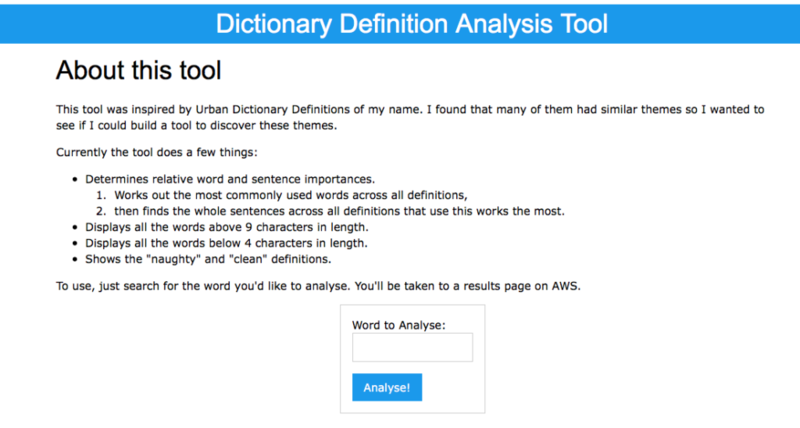 If not, fetch the definitions from Urban Dictionary’s unofficial API. Remove the common words from the results before analysing them to avoid bothering with “that” and “the” and, “and” etc. Based on that, work out the whole sentences that contain those words, ordered by which sentences contain the most of the top 10 words in the sentence. If I’m building an analysis solution manually, I need to know that it works. I tried to use TDD here so I could verify that my code works as I write it. To prove that the naughtiness detection is working correctly, I wrote a test that should pass if the given sentence is classed as naughty and one where I know the given sentence should be classed as clean. With unit testing, I can also ensure that my code still does the same thing (or at least doesn’t break) if I try to optimise it. To determine clean or naughty definitions I used some lists of naughty words I found and assumed that the definition is naughty if it contains a word in that list. This method has some problems though, to do false positives. It’s my intention to present this at Hacks/Hackers Brisbane so I’ve made (started?) a presentation on the process which is available on Google Slides.